Computers play a vital role in any project. Biotechnology is no exception. Everything that we know today about biotech, we owe to bioinformatics. When it plays such a vital role in biological studies, it would be really prudent to exploit it to understand our projects further. Insilico analysis was done to construct a 3D model for this part. The sequence for this part was obtained from the iGEM registry and submitted to SWISS MODEL .The protein with the highest sequence similarity was found to be template 2ib5.1.A, which is also a chromoprotein. The secondary structure of this protein was used to construct a 3D model for cjBlue. The predicted 3D structure was a homo octamer. Each monomer subunit had a β barrel with a central α helix. To determine if the predicted model was authentic, we generated the Ramachandran Plot for this model by using the SWISS MODEL Workspace. A score of 94% in the most favoured regions as was seen in the Ramachandran plot showed that the predicted model of cjBlue, green chromoprotein is a very good prediction. To find further information on this protein we used ExPASy - ProtParam tool to compute the various physical and chemical parameters for cjBlue. The computed parameters included the molecular weight, theoretical pI, amino acid composition, atomic composition, extinction coefficient, estimated half-life, instability index, aliphatic index and grand average of hydropathicity (GRAVY). And finally, it would be a shame if you created a wonderful construct with this part, but then this protein was cleaved by an enzyme produced by your chassis organism, now wouldn't it? To tackle this problem we created a database of all the enzymes that would cleave this chromoprotein, the number and position of the cleavage sites using ExPASy Peptide Cutter. Interested in knowing about this protein? click here. We used SimRNAweb which is a web server for RNA 3D structure modeling to create a model for the RNA thermometer. Interested in seeing the secondary structure of this model? Click here. Similar insilico analysis to cjBlue was done for this part. The sequence for this part was obtained from the iGEM registry and submitted to SWISS MODEL . The protein with the highest sequence similarity was found to be FAR-RED FLUORESCENT PROTEIN AQ143. 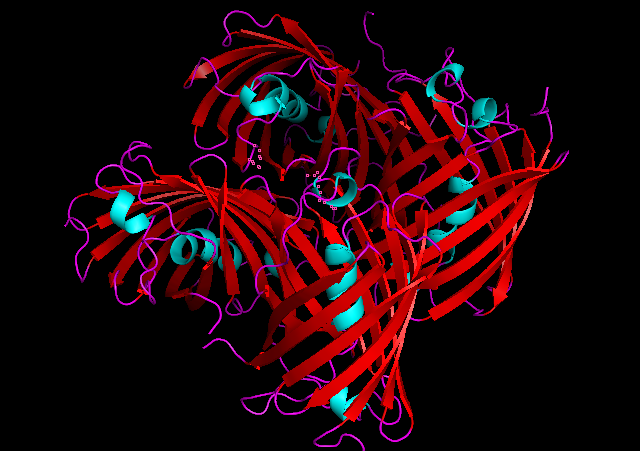 The secondary structure of this protein was used to construct a 3D model for tsPurple. The predicted 3D structure was a homotetramer. Each monomer subunit had a β barrel with a central α helix. To determine if the predicted model was authentic, we generated the Ramachandran Plot for this model by using the SWISS MODEL Workspace. A score of 93.3% in the most favoured regions as was seen in the Ramachandran plot showed that the predicted model of tsPurple chromoprotein is a very good prediction. The instability index (II) is computed to be 31.19.